Bedugul Botanical Gardens, a really lovely place in the Bali highlands with cool temperatures and lots of birds. With car hire being exceptionally cheap in Bali (US$18 per day for a small car with unlimited mileage), it made sense to trade in the scooter and take the safer, more comfortable option. I decided to head to the central highlands, an essential port of call for those wanting to see some of Bali’s montane bird species. 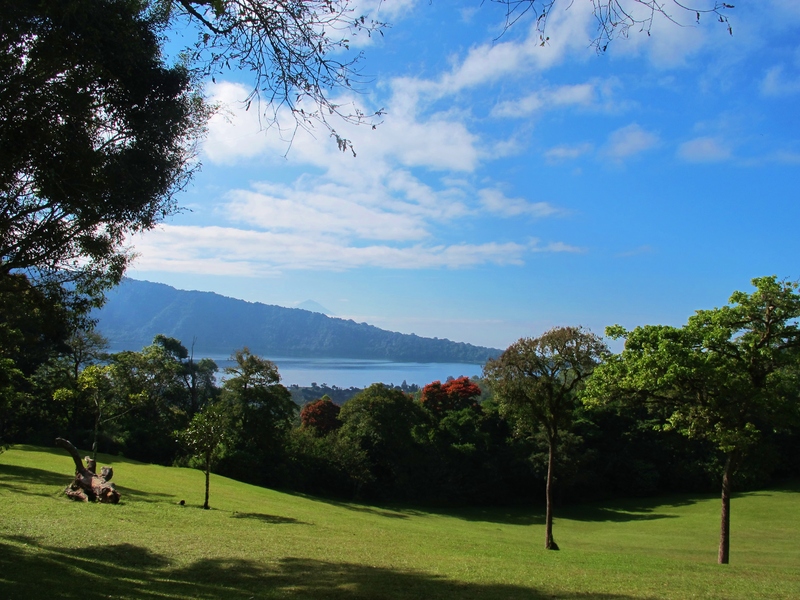 I focused my attention on the famous Botanical Gardens at Bedugul, which resemble well-manicured English parkland in places, and contain a wide range of tree and plant species. The climate is cool and pleasant up here at an altitude of around 1,300 meters above sea level, and afternoons are often cloudy or misty with spots of rain. Birding can be very good here, even in the afternoons, with plenty of opportunity to see regional specialities and endemics; species such as Flame-fronted Barbet, Javan Grey-throated White-eye, Blood-breasted Flowerpecker and Short-tailed Starling are very common. A fairly good map of the gardens is handed out at the gate. You can drive your car into the gardens for an additional fee, which is worth it in the early morning as it enables quicker access to more distant areas of the park. The first road to the left goes through some good habitat, including some denser forest around a gulley that might produce skulkers like Lesser Shortwing, although I didn’t see one. The quieter reaches of this road are good for Javan Whistling-Thrush in the late afternoon, I had several on the grass verges as daylight started to fade, and again in the early morning the next day. The edge of the denser forest held Fulvous-breasted Jungle-Flycatcher, with a Sunda Warbler in a mixed feeding flock that also contained Greater Racket-tailed Drongo and Grey-headed Canary-Flycatcher. Deeper into the gardens, some trails at the far north east pass through a little-visited area of primary montane forest. Birding was much harder here than in the manicured parklands, but this is where I had my only sightings of Crescent-chested Babbler, Chestnut-backed Scimitar-Babbler, and several juvenile Sunda Cuckoos being tirelessly fed by their “parent” Mountain Leaf-Warblers. Yellow-throated Hanging Parrot is a speciality of the area, but typically for sightings of this genus, my bird passed quickly overhead, calling loudly, before disappearing far away. I also paid a short visit to nearby Lake Buyan, where I failed to find my target White-browed Crake, but did have great views of several Freckle-breasted Woodpeckers, a Striated Grassbird, and a Yellow Bittern. Bedugul Lifers: Grey-cheeked Pigeon, Blood-breasted Flowerpecker, Short-tailed Starling, Javan Grey-throated White-eye, Flame-fronted Barbet, Fulvous-breasted Jungle-Flycatcher, Sunda Cuckoo, Crescent-chested Babbler, Javan Whistling-Thrush, Yellow-throated Hanging Parrot, Dark-backed Imperial Pigeon, Chestnut-backed Scimitar-Babbler. Bedugual Year Ticks: Mountain White-eye, Mountain Leaf-Warbler, Black-winged Flycatcher-Shrike.